About the series: Texas holds the all-time series lead 22-16. The Longhorns have won four straight in the series, including both games during the regular season last year and a 68-64 win in the Big 12 tournament. It’s the longest such streak since winning seven straight from 2006-2011. 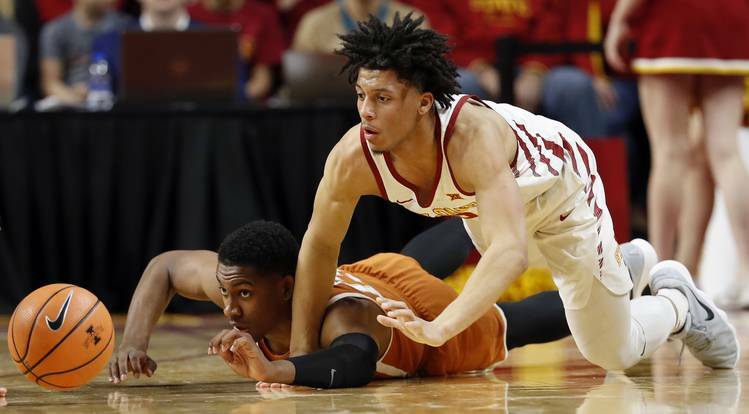 About the Longhorns: Coach Shaka Smart’s club pieced together a full 40-minute effort on Tuesday in a win over Kansas. Can the Longhorns do it again on the road? “There’s a lot of poison that’s out there that can be digested in your mind and your heart,” Smart said. “If you really want to win, this is what we have to do, this is non-negotiable.” They players will concede they can beat any team left on the schedule. It’s solely about their attitude. Senior Dylan Osetkowski is having one of his best stretches as a Longhorn. He’s averaging 13.2 points and 8.2 rebounds over the last five games. Freshman Courtney Ramey has made 10 of his last 18 3-point shots. About the Cyclones: Saturday’s game could be a little odd for Texas assistant Neill Berry. He was at Iowa State under coach Steve Prohm and the lead recruiter for guard Lindell Wigginton, who scored 28 points against West Virginia on Wednesday. Berry suddenly joined the Texas staff during the offseason, a move few in Ames saw coming. Guard Marial Shayok, a Canadian-born transfer from Virginia, has carried the Cyclones all season. He’s averaging 20.2 points in the last five games. Thank goodness basketball is played indoors. The temperature Thursday afternoon in Ames was 2 degrees. It’s expected to get up to 43 degrees on Saturday.